Bangkok, Thailand (October 9, 2018) – Major Cineplex Group strongly addresses its pace as a leader in Lifestyle Entertainment Business, especially in the era where technology and digital gadgets are the fifth requisites, extending the cinema business to be more than ‘Theater’. The first Esports Theater is about to be launched firstly in the world. Majors bound up with Dell Gaming, the World Giant in Computer Equipment for gamers, as Naming Sponsor under ‘Dell Gaming Esports Cinema’. Besides, the leaders in IT Technology and Computer; Intel, Neolution, and True Online also unite for the partnership support. This joint ensures Esports as an official sport will encourage gamers to utilize the Esports Theater for their practice session and later International Stage Competition. Narut Jeansanhong, Chief Marketing Officer, Major Cineplex Group PLC., stated, as a leader in Lifestyle Entertainment Business, Major Cineplex Group determine in incorporating the latest development of innovation and technology to Cinema Business, for Thai users to experience the impeccable entertainment service, especially in the Era of Technology and Digital. Recently bounded up with Dell Gaming, the World Leader in Computer Equipment for gamers, for the launch of the first ‘Esports Theater’ in the world, at the forth theatre, Esplanard Cineplex Ratchada under the name, ‘Dell Gaming Esports Cinema’. 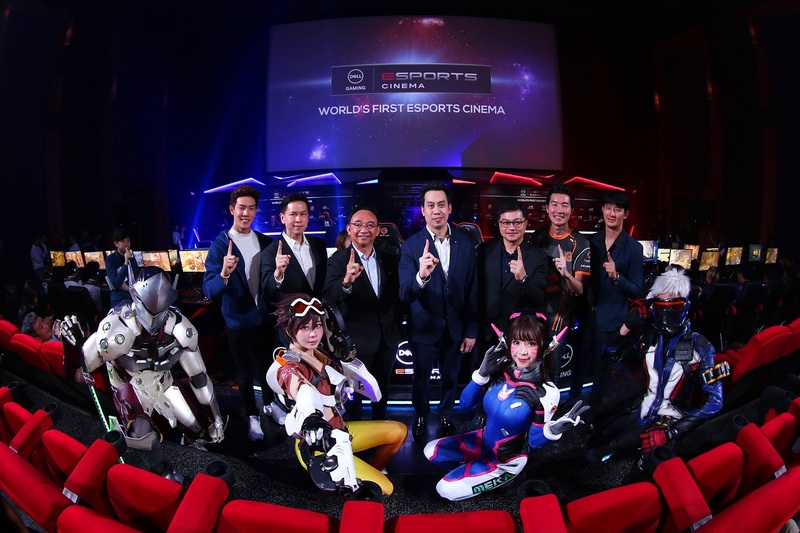 The launching of ‘Esport Theater’ is considered to be the significant leap in Cinema Business offering the exclusive experience much more than a theatre, and is expected to expand more outlets. Recently in February, Major Cineplex Group initiated its business extension to Gaming Business for the first time by partnering with IMAX, the World Leader in Screening Technology, opening the first IMAX VR in South East Asia, at Paragon Cineplex, considered as the first to offer hands on experience in Virtual Reality and received great massive responses from Thai and foreign audiences up to 300 people per day. The ‘Esport Theatre’ is designed to be an Entertainment Alternative, underlying Major Cineplex Group as the true leader in Lifestyle Entertainment Industry, as well as the first ideation of theatre in the world, constructed to support the ‘Esport’ competition trend, which is estimated to be over 10,000 million Thai Baht in value with 12% growth in Thailand. With the governmental support, the registration of ‘Esport’ as the official sport has been approved and appointed as the new sport in Asian Game and Olympics Game in the near future. Major Cineplex Group is very well-prepared in the solutions for Digital Lifestyle of the new generation, marking Thailand as the centre market of Esport in Asean. Dell Gaming Esport Cinema is the mixed-use theatre, designed to fit the screening as well as Esport Activities. With the potentiality of 4K Screen, 14.6 x 6.1 meters in size equal to 622 inches TV Screen, Dolby Surround Sound System 7.1, and the stadium seating, it is viable to contain up to the maximum of 60 contestants along with 200 audiences. The Esport Theatre is expected to create the remarkable experience for Esport Competition, unlike any other competition stage, due to the optimum quality of visual and sound system. The service fee for Esport Theatre comes in 2 types; the all-day pass for 200,000 Baht and the half-day pass for 100,000 Baht, with the time options from 10.00 – 15.00 or 17.00 – 22.00. The fee is inclusive of all equipment and internet usage. Anotai Wettayakorn, Regional Director Indochina Dell Asia, stated Dell Gaming and Alienware are very overwhelmed to join with Major Cineplex Group for the opening of Dell Gaming Esports Cinema, as the center of Esport Service to support massive gamers as well as interested peers in computer games to enjoy the Esport experience and challenging activities and competition to their highest satisfaction. As for Dell, our over 20-year experience in Innovation and PC Gaming, we are gratified to deliver the highly qualified system with latest technology to help gamers reaching its highest potential in their competition. Dell Gaming Esports Cinema, offers multiple gaming equipment in various models from Dell Gaming and Alienware to ensure the exciting experience for users across all sensation; i.e. Laptop Dell G7 Gaming, Desktop Alienware Aurora (R7), Dell 24 Gaming Monitor Screen (S2417DG) and more. Sontiya Nujeenseng, the President in Distribution of CCG Platform in Asia Pacific and Japan, Intel Technology Asia Pte Ltd., stated Intel truly value the potential in eSports market and Gaming in Thailand. Therefore, the investment in the support of eSports Gaming Competition in international leagues has long been planned, as well as the creation of the partnership ecosystem to facilitate the collaboration with partners and the continuous development in technology to deliver the advance gaming experience for gamers. Dell eSports Faming Cinema perceived as great example of Intel in collaboration with partner and elevate the ecosystem in the industry to greatly benefit end-users with mini PC or NUC, Hades Canyon Model, the current smallest gadgets of Intel. Satien Boonmanun, Chief Executive Officer of Neolution, stated with all mentioned, eSports Cinema is fully ready to support all offline Tournament Competitions, the selection of Thai contestants for National and Global Stage Competition, as well as the Live of Global Competition for eSports Fans. The venue is also viable to hold the event of community game from Official Thailand Fanclub across all game platforms; i.e. DoTA, Overwatch, PubG, FIFA, and etc., the opening event of Gaming products for special exclusive fans to test and trial demo game on-hands all together in eSports Cinema. It is the favorable solution for small and medium scale event for eSports Activities. Thanapoom Parkwisarn, Director and Chief in True Online, True Vision and Convergence, True Corperation PLC., Stated True Online as the No.1 leader in Broadband Internet with highest coverage in Thailand are gratified to be part of the sponsorship in Fiber Internet in eSports Cinema using the Gigabit. It is well-informed that eSports Trend is raging on a global scale as well as in Thailand. Most importantly taken into consideration is the security of Broadband Internet in usage for the online competition at high standard to ensure the continuity of the live competition. True Online has always been trusted by the Global Game Publishers to support in the competition in Thailand; i.e. OverWatch, Pub G and etc. Thailand sSports Community (Thai League) also directs True Online as the major support in Fiber Internet across all of its competitions. This is to encourage the talent in younger generations to shine their ability, as well as to support eSports contestants for national representative for Global Round in the future. True Online is considered to be the one and only to offer the special package ‘True Fiber Gamer Pro Pack’ for eSports Gamer in particular. The package comes with highest technology of 1 gbps for gamers and eSports contestants, suitable for all practice session and effective competition to reach their highest potential. Lastly, eSports Cinema is supported by 1 gbps for national and global stage competition.